Sleepiness is just as risky to a driver as is drinking and driving. Bring sleepy is dangerous to the driver and to the other people driving, biking or walking on the road. Just like alcohol, being sleepy slows the driver’s reaction time, decreases one’ awareness of one’s surroundings, increases the risk of having an accident, and impairs one’s judgment. Investigators find it impossible to prove with certainty that an accident was caused by sleepy driving, especially in a fatality; however, there are several clues to look for at the scene of the crash that can tell the investigators that sleep was a factor. For example, if only one vehicle was involved, if the injuries are fatal or if there is suspicious lack of evasive maneuvers or skid marks. In alcohol-related collisions, at least there can be blood or breath testing to show causality; in sleep-related crashes, no such objective test exists and police officers must make an educated guess as t0 what caused the crash. There are several definitions of the term sleepy. Common terms are drowsy, tired or exhausted; even “sleep-deprived’ can be a proper term. The main causes of sleepiness while driving include having too little sleep, having a chronic sleep debt, having an interrupted sleep or fragmented sleep, having a sleep disorder, circadian factors, using alcohol too much or using sedating medications. These causes can come in combinations of problems. People who are sleep deprived can suffer from information processing difficulties, problems with short-term memory, impaired judgment, poor vision, impaired reaction time, poor performance, increased moodiness and increased aggression. A study was done in Portugal, which has one of the highest rates of road fatalities in Europe. Already an association had been drawn between sleep disordered breathing and auto accidents. This study looked at the prevalence of sleeping excessively throughout the day and other sleep problems in truck drivers who run the risk of driving while sleepy. A total of 714 truck drivers were studied. Twenty percent of truck drivers had excessive daytime sleepiness and 29 percent were at risk for suffering from sleep apnea. Thirty six percent admitted to having near miss accidents of which nearly half were sleep-related. The Epworth Sleepiness Scale or ESS was used and predicted accidents and near-accidents if the ESS score was greater than 11. The use of antidepressants was related to having accidents. What they decided was that sleep-related disorders had a strong effect on the incidence of driving accidents. The risk of accidents seemed to be related to antidepressant use and sleepiness. They felt that drivers should be assessed for sleep-related fatigue disorders before providing them with their trucker’s license. 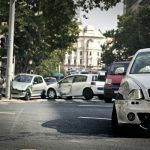 I’m Ed Smith, a Sacramento Trucking Accident Lawyer with the primary accident information site on the web, AutoAccident.com. If you or someone you love has been injured in a trucking accident or other vehicle collision, call me now at 916-921-6400. You can find out more about our office by looking either Yelp or on Avvo, the attorney raring site.